So many of you nominated ~84 for Sea Lion of the Month! This sea lion is also fondly referred to as ~♥ because at certain angles the number looks like a heart. As many of you know by now, the ~ (tilde) symbol means this animal was born and marked at Gillon Point on Agattu Island. This sea lion is a male and when he was marked on June 25, 2013 he weighed about 83 pounds and was almost 4 feet long! Here you can see ~84 hanging out without his mother. This image was captured on June 15, 2015. From the remote camera images, we observed ~84 and his mom stayed at his birth site, Gillon Point, only until early July. It’s likely that his mother took him to another site nearby. When females go to sea with their pups, the pup will usually ride on its mother’s back. We didn’t see them again until they showed up in the remote camera images at a nearby site: Cape Wrangell on Attu Island on October 2, 2013. He was seen regularly at Cape Wrangell for the rest of 2013 and into 2014. We even saw him here during our research cruise in the Aleutian Islands on June 23, 2014! And of course, many of you have been seeing him on remote camera images captured at Cape Wrangell. It seems he likes this spot! Interestingly, one of our biologists on the Steller Watch team noticed his mother nursed him until at least May 18, 2015. Juveniles do start foraging for fish at a fairly young age but they will still supplement with their mother’s milk for as long as she will allow. When females stop letting their juveniles nurse, we call this weaning. Have any of you seen him suckling from his mother in the images? If not, this is a good indication that he was weaned so he’s on his own. Females do this so they can have enough energy support their new pup on the way. It’s quite a lot of work to forage for enough fish for yourself and to produce milk for your pup! Females are able to have a pup every year, which we see quite often, especially in the eastern population. Out here in the Aleutian Islands, we tend to see females stay with their offspring for longer periods of time. Often up to two years and sometimes even up to three years! On occasion, we even see a female nursing both a newborn pup and her juvenile born in the previous year or two. This juvenile is likely weaned shortly after the pup is born since supporting two offspring requires too much energy, or food and foraging time. Great news: We will now share the stories of two marked sea lions (instead of just one) each month! There has been so much interest to hear the stories of marked sea lions that we need to kick it up a notch. Be sure to check-in on the 1st and 15th of every month to learn about our featured Steller sear lion. As always, you may submit the mark of your nominees to the Sea Lion of the Month forum. Thank you all for your nominations! 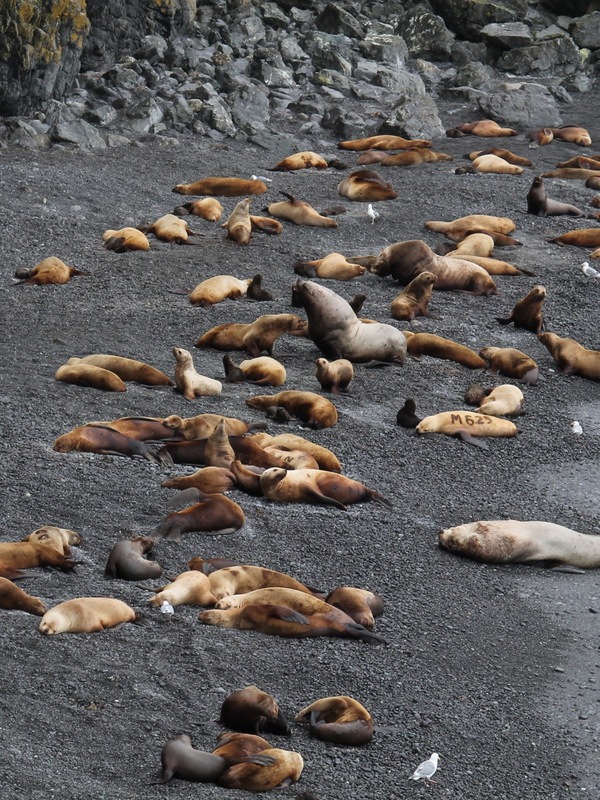 We partner with Russian scientists to study the entire western stock of Steller sea lions that extend beyond the boundaries of the United States. They monitor and maintain up to 50 remote cameras at known sea lion sites to look for marked animals. For April, we are featuring a Russian born sea lion, M625 as our Sea Lion of the Month. She’s a popular sea lion—many of you have submitted her to our Sea Lion of the Month Nomination. She has quite the story to tell! She was born and marked on Medny Island, Russia on June 27, 2004 and weighed 64 pounds. Medny Island is a part of the Commander Islands which is located just over 200 miles northwest of the Aleutian Islands, Alaska (United States). M625 is 11 years old and lying next to her pup in this image captured in summer of 2015 on Cape Wrangell (Attu Island). During her younger years, Russian scientists recorded observations of her at numerous sites on Kamchatka Peninsula. She returned to her birth place on Medny Island and gave birth to her first pup on June 13, 2010, when she was six years old. The following two years, she was observed throughout the Kamchatka Peninsula with her offspring. In 2014, she returned to Medny Island again and birthed her second pup on June 11, 2013 (when she was 9 years old). She wasn’t observed in 2014 and then only seen once in Russia in 2015 . . . Here is where her story gets interesting. Scientists spotted her at Kozlova Cape on Kamchatka Peninsula on May 26th, 2015. The next sighting of her was captured by our remote camera on Cape Wrangell (Attu Island, US) on June 9, 2015. This same day, she gave birth to her third pup which means, in just two weeks, she traveled over 430 miles and give birth on Cape Wrangell! Aren’t these animals amazing? We have only processed images from this site captured up to the end of June 2015 so keep an eye out for M625 and her new pup! Many of you have already been seeing her repeatedly in the images. Here’s a link to a great image reported by a fellow citizen science where you can see her with her pup (right side, middle)! Our very first Sea Lion of the Month is ~26! She’s the ‘cover girl’ featured on the About project page. This sea lion was one of the first to be marked in 2011, when this project began. She weighed 67 pounds and was a little over 3.5 feet long—a very healthy pup! We have seen her quite often in our remote camera images and in person during our research cruises in 2012, 2013, and in 2015—when we took the picture above. She seems to be staying local, near her birth place at Gillon Point (star, map left) on Agattu Island. We have also seen her at Cape Sabak (on the same Agattu Island) and nearby on Alaid Island (circled stars). We didn’t see her during our summer 2016 research cruise but don’t worry, it seems she can be elusive since we didn’t see her in 2014 either. She would be just over 5 years old which means the next time we see her, she could have a pup. Keep an eye out for her in the images! If there is a sea lion you keep seeing and would like to know more, head to the Sea Lion of the Month Nomination forum to submit the full marking and we will try to feature that sea lion and share what we know of their story on the first of the month.